Cousin’s Weekend – Team Boys! My sister and I both have 2 children – and both a son and daughter. My son is 7 1/2 and my daughter is almost 5. Her twins are 4 1/2. The kids really enjoy having “switcheroo” sleepovers, where the boys sleep at my house and the girls sleep at her house. Hannah, who rarely plays with dolls, loves playing princess and dress-up with her cousin and spending time with her aunt and uncle. Noah adores both of his cousins, but has a blast having another boy around who can keep up with his endless amount of energy! and to see the animals in the petting zoo. It was so cold and windy, but the kids liked all the animals plus they got to feed them crackers! The donkeys were the loudest and one sounded like it was crying! …and cut down some bushes. In 10 years or so, they’ll be a pretty good grounds crew! 🙂 Oh, while we were outside I introduced my nephew to “Aunt Kim tissues”, too… (the edge of my shirt or sleeve for little noses). When the boys got too cold we went inside where they wrestled and played cars. 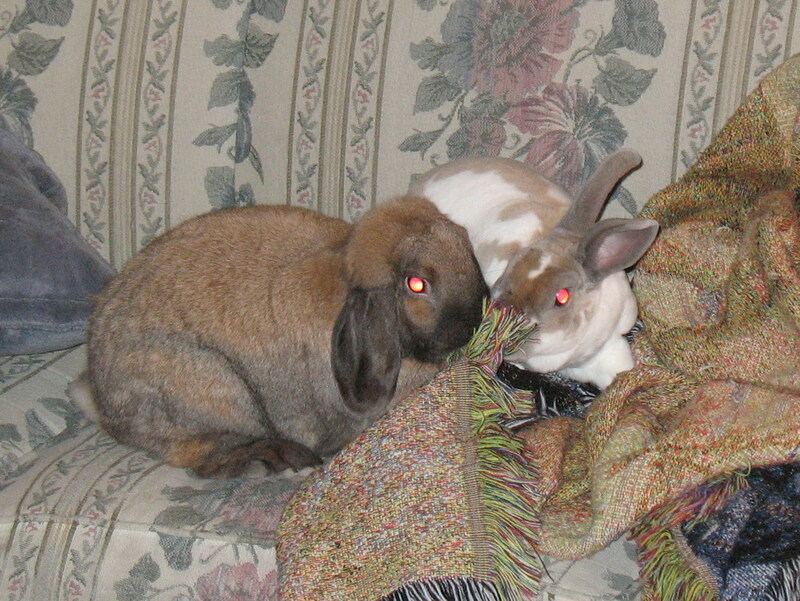 After dinner, they watched some tv and snuggled with Fastnacht, our house bunny. Sunday was even colder and windier, but they boys insisted on riding bikes again. They managed to stay outside for about an hour in the morning and again in the afternoon. They perfected riding on ice (which was nerve-racking for me), but at least my nephew had training wheels on his bike! We visited the sheep, but the sheep didn’t want any attention since we didn’t have food. My nephew got to see his favorite sheep, Fiona, who he said was “all grown up and beautiful”. At lunch Dave opened his venison (or benison!) summer sausage from Shaffer Venison Farms. After I ate some the boys each tried some. We sent some sausage pieces home with my nephew because he liked it so much and that night I got a text from my sister, “Is this really deer sausage? … He wants me to get him more. He was so excited when he remembered he had it.” I know what he’ll be getting for his birthday this year! …and played “Octonauts” (a Disney show) while snow flurries swirled around! The kids’ fort was their headquarters and the bikes were their Gups (submarines). At one point my nephew asked for a tissue and I told him I didn’t have one (hoping to go inside – I was freezing!). He said, “What about an Aunt Kim tissue?” Haha! Everyone had a wonderful weekend and I love having my nephew stay with us! I think we were all tired out by Sunday afternoon and slept well Sunday night! We’ve had house rabbits in the past (Beau lived till he was 8 and Lola lived till she was 7) and our kids have been asking to get more rabbits for a while now. 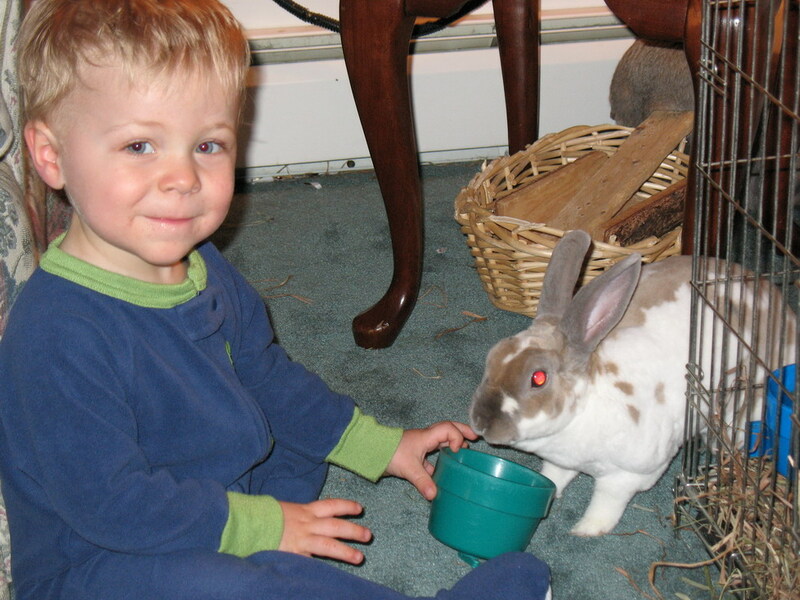 On Sunday we went to the PaSRBA Convention in Lebanon, PA and the kids chose 2 rabbits to bring home. Noah chose a broken black Mini Rex buck and named him Fastnacht (fosh-not). For anyone not familiar with what a fastnacht is, click here. Hannah picked out a black otter Netherland Dwarf doe. She first picked the name Blackie, but then decided on Black Rock. I guess Blackie wasn’t creative enough for her! They are each 3 months old and in separate cages until they can visit the vet, but here’s a cute picture of them together when we first brought them home. At the Day home … they fell in love. At the Day home … she lost her love. I’ve always hummed Copacabana whenever I think of Lola so I thought writing this was fitting. We lost her a couple weeks ago – I took her to be euthanized on February 21st. She was the 1st pet I had to do this for and it was difficult. My eyes welled up with tears while I filled out the necessary form, and I had trouble signing my name to it. Hannah was with me at the veterinary office but Noah was, thankfully, at school to make up a snow day. I held Lola in my arms until it was time for the vet to give her “the” injection. While we were waiting 2 teenage girls who were there with their mother (and their cat) played with Hannah. Even this day, God showed that He was with us by sending those girls to keep Hannah happy and occupied. Monday morning, around 6:15am, the phone rang… the dairy farm we had contacted about Jersey bull calves had 2 waiting for us. I had built a large wooden box for the back of our mini-van so that we can transport a couple animals without hitching up the trailer… actually Aunt Celie’s trailer. Anyway, we loaded the box in the mini-van and after dropping Noah off at school, Hannah and I went to Gap, PA to pick them up. I think the family we purchased the calves from might still be talking about us putting calves in the back of a mini-van! One of the calves was 1 day old (born on 2/13) and the other was 10 days old (born on 2/4). This week was a great time to get them because Dave is taking classes in Philly so I’m not working this week. 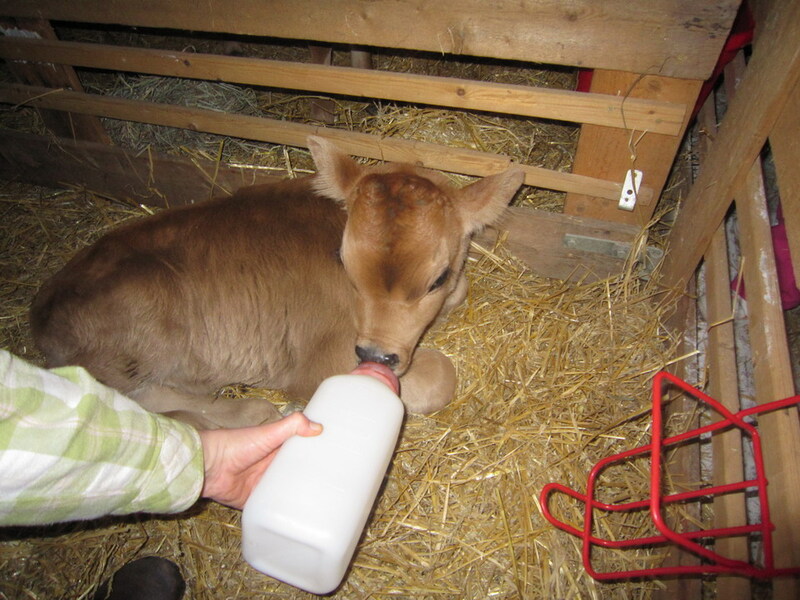 The older calf needs to be bottle fed twice a day and the younger calf will get 3 bottles a day till he’s a week old. I wanted to call them Thing 1 and Thing 2, but Noah decided they should be named Burger and Sandwich. We castrated them by banding them Tuesday night before giving them their bottles. It’s definitely more involved than banding tails to dock them. We don’t castrate ram lambs so I didn’t realize how tricky it is to get both testicles on the right side of the band! The calves didn’t even flinch when I got the band on and they’re doing fine today. 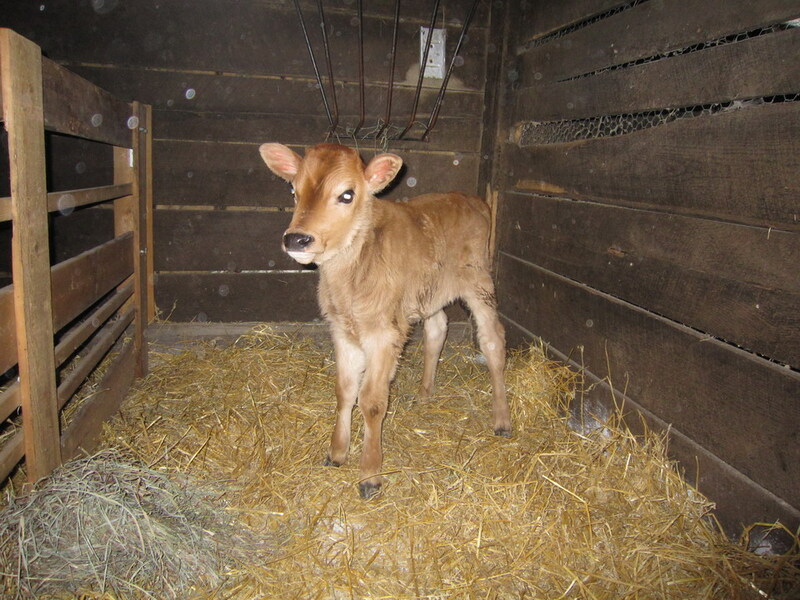 Stay tuned for more calf stories! 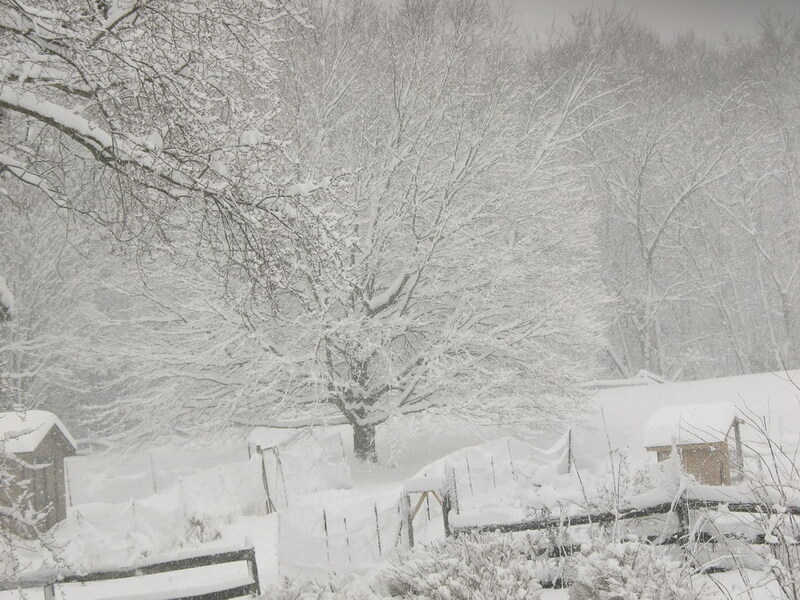 Here are more pictures of our snowy farm! 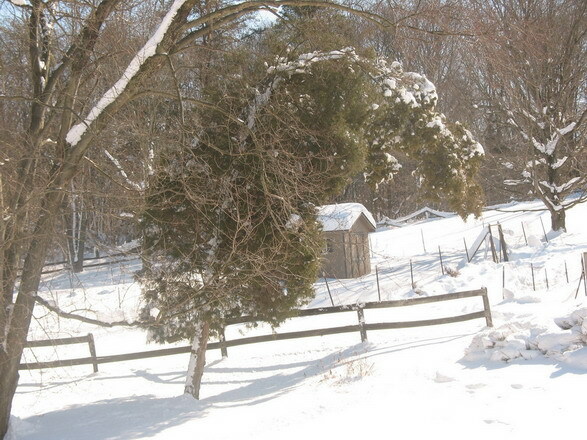 Why buy an expensive weeping cedar tree when all you need is a good blizzard?! 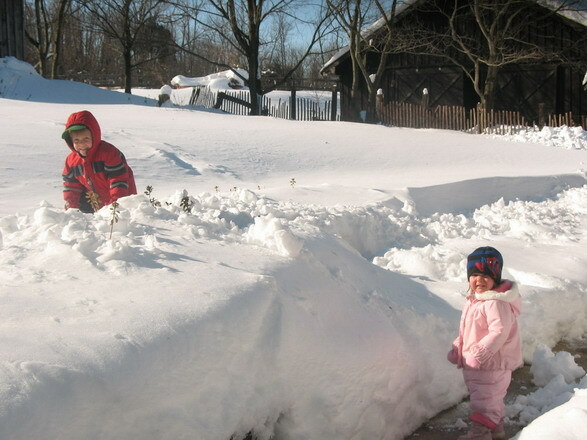 Hannah and Noah in the snow. Noah has been having lots of fun. Hannah, on the other hand, asks to go in the house 5 minutes after we get outside. She can be bribed to stay outside longer if we go see the animals. 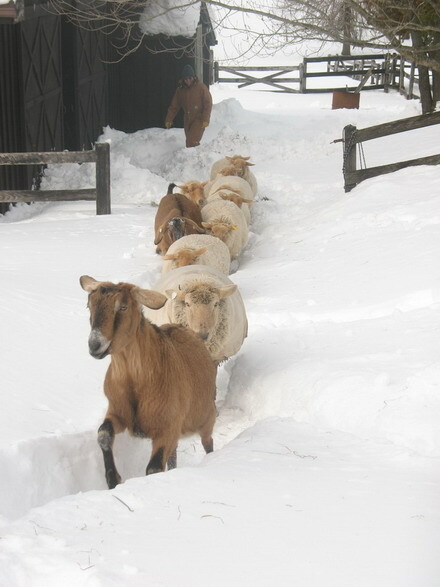 The sheep and goats going up to their pasture. 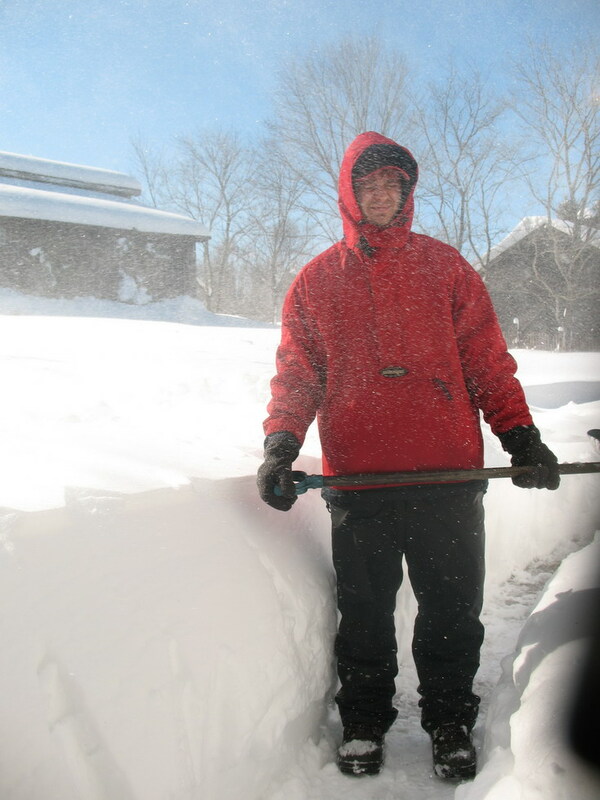 Dave shoveled paths from the barns to the pasture and to the house. He also shoveled out a big area for the sheep in their field. Giant icicles on the front of the house before I knocked them down. 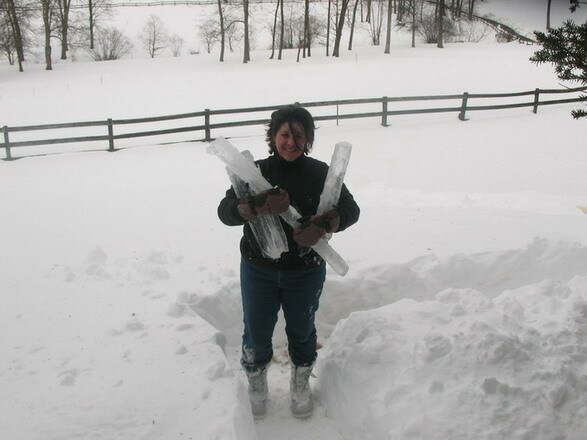 Me holding some of the biggest icicles. Just in case the snow we got last weekend wasn’t enough we got hit yesterday with a blizzard! The forecasts predicted we would get 6″-8″ of snow last Friday and Saturday….we got 15″. Yesterday we got an additional 2 feet of snow dumped on us! The snow started Tuesday around 7pm and ended around 10pm Wednesday night. We tried to keep up with it by plowing every 3 hours or so, but by dinnertime only the lawn tractor could fit down the driveway. It just wasn’t powerful enough to push the heavy snow back. This morning after breakfast Dave went out to try to push the snow back. He ended up just shoveling a large area. Our new neighbor hires someone to plow her drive and they showed up with a Bobcat and a tractor with a front-end loader. We ended up calling her to ask if they could do our drive, too. It was just too much! They did ours and our other neighbor’s drive, too. The mounds of snow are just amazing. I’ll post some of those pictures tomorrow. 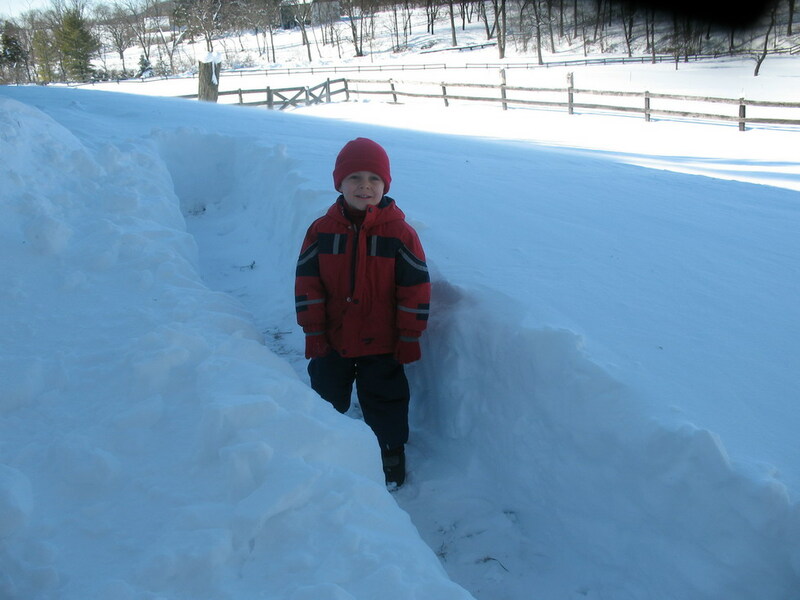 Noah went out with Dave in the afternoon and was upset that there wasn’t a lot to shovel! That’s all he wants to do right now. In the summer he’ll want to pretend to mow or weedwack. 🙂 They did sled down the hill in the front yard, or at least they tried to sled. The snow is so deep that they could only get about 3/4’s of the way down the hill. Ringing in the New Year – UK Style! 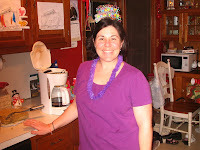 We celebrated New Year’s Eve with some of our friends who also have young children. We thought a British theme party would be fun & then we could celebrate the New Year early so the kids wouldn’t be so cranky. We counted down to midnight GMT (7pm eastern) and the kids had fun blowing horns and wearing their hats. We had lots of yummy food and I enjoyed making new recipes. I tried bruchetta with sheep cheese and wilted greens. The warm Locatelli cheese on bread with greens and drizzled with balsmic vinegar was terrific! I can’t wait to make it again! We also had artichoke cheese dip, mini quiches, fresh veggies and dip, cookies and chocolates. I had lots of fun exploring allrecipes.co.uk for British recipes and settled on Bangers and Mash (pork sausage and mashed potatoes) and Buttered Turkey for dinner. Noah loved the sausage in the gravy! I can’t remember when he’s eaten that much meat. 🙂 I cooked one of the turkeys we raised this summer and it was so good with all the seasonings and butter! 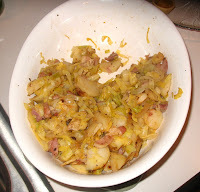 One of our friends brought Bubble & Squeak as a side dish, even though we think it’s more of a breakfast dish. It’s made with potatoes, ham, bacon and cabbage. I think you can add any veggies you have to it. 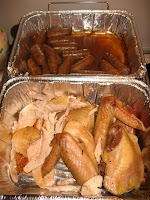 Traditionally it’s made with the leftovers from Christmas dinner. 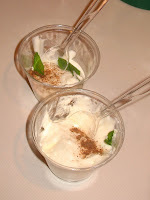 For dessert I tried out 2 super-easy recipes… Lemon Syllabub and Apple Crumble. The Lemon Syllabub was so light and creamy! It’s made by whipping heavy cream and adding sugar, lemon juice and lemon zest. After sprinkling a little nutmeg on top it’s ready to eat… Yum! We’re already thining about next year’s party and wondering what country should be our theme! Any suggestions?